Advent Journey | What did she do today? Can I have 1 more week before Christmas? Seriously, if I could I know I could get all the things I want to do before Christmas done. I’m sure I’m not alone in this feeling. If we all ban together we could me the change! Of course if we had to do that, we’d still need another week to finish eveything we didn’t do while we were lobbying for the change. Okay, it seems like a cyclical mess. Okay, I’ll just have to throw some things off the list and make a list for next year so I remember all these great ideas I haven’t the time for this year. I’m afraid I’m coming down with a cold. I’m feeling a tickle in my throat and I’m getting that “feeling” in my head that I’m a little off. Hopefully a good night sleep and the Orange Juice I bought tonight during my last minute errands, will do the trick. I did make socks for mini. I used art yarns super wash merino. I love making socks for her out of that yarn. It works up fast, it’s washable, and the colors are yummy. I did a simple toe up formula sock. I think she’ll really like these. We’ll see what I can get done up tomorrow. I must prioritize, make a list and conquer that list! May you find all the time you need to finish up your projects! It’s been snowing all day, literally, no stopping. It started yesterday sometime, I don’t even know but maybe it’s been 2 days straight…all I know is that tonight just before posting this, I lost power, Again!! I woke up this morning to power, but no internet connection. I am finally fully online again, so here is a picture of Mini sledding with her friend Lydia, and last night’s post. Working on hubby’s sweater vest. Back is done. Front is started! I like working with simply wool. It feels so nice in the hands. It’s soothing…which I need in my knitting right now. I boxed up my Holiday Traditions swap, and will bring it to the PO with the last of the ordered Car Catch-alls tomorrow. I have a sweet little video to share…a sort of Advent Journey with music by Sixpence None the Richer. For to us a child is born, to us a son is given, and the government will be on his shoulders. And he will be called Wonderful, Counselor, the Mighty God, Everlasting Father, Prince of Peace. This is prophecy from the book of Isaiah long before Christ came. It described what the Messiah would be like. Christ came to bring peace. Peace through a renewed relationship with the our Creator. The kind of peace that surpasses our situations, circumstances and life experiences. I had a great time at the Farmer’s Market. There were fewer vendors, not a lot fewer, but definitely fewer, and few people braved the weather than last time, but the folks that were there seemed to be serious about buying and the choices were still plentiful. I still have a fair number of potatoes, Garlic and Squash from my own garden, as well what I stocked up on at the last market, but there were plenty of all of those to be found. The meat folks were well stocked, and the maple syrup and gifty items like spiced nuts and cookie dough was out for the tempting…and I did succumb. I got 3 pounds of Sweet Italian Elk Sausage since I loved it so much last time. I made up a batch of pea soup almost as soon as I arrived home! This time using just 1/2 pound and I’m much happier with that ratio. Rutabaga and Turnips for a lovely root veggie soup. I got a pound of Elk burger to try, along with a couple more pounds of beef from my regular farm. I bought maple syrup from a delightful fellow who makes it himself, using low heat to hold in flavor and nutrients. It’s oatmeal season around here and I don’t like to go cheap on the syrup! I picked up a pint of cookie dough for those days when I just want a couple as a night time snack. Oh, and not to forget the 1 1/2 year aged cheddar cheese! Delightful and so creamy. “Farm subsidies. Farmland preservation. Food-borne illness. Antibiotic resistance. Genetic engineering. Clones. Corporate power. Globalism. Biosecurity. Factory farms. Chemical use. Healthy food. Organic certification. 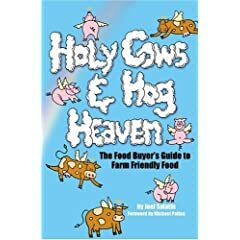 The book is meant to Empower food buyers to pursue positive alternatives to the industrialized food system. Bring clean food farmers and their patrons into a teamwork relationship. Marry the best of western technology with the soul of eastern ethics. Educate food buyers about productions. And create a food system that enhances nature’s ecology for future generations. Does any of that interest you? I hope it does and if you want a copy you can get it on Amazon.com for a $12.21. After the market we took a trip to the milk farm. They were at the market, but not with their milk and cream as they aren’t allow to sell it there. Good food, being illegal to sell in to the public…seriously what has this world come to? But I won’t jump on that soap box right now. I stocked up on milk, yogurt and they have a new cream separator so I was able to get some whipping cream! I think that will go on top of some blueberry rice pudding very soon. Mini loves her new Pj’s. I saw no need to wait until Christmas to impart this little gift, as no one should wait to be cozy if they don’t have to. I wrapped up the collection of goodies for my Holiday Traditions trade. I’m late, but she is too, and we both understand each others delay, so it’s worked out well. I’m sending off on Monday and I hope it arrives before Christmas, but if not I hope she enjoys getting late goodies as much as I do. My mom never remembers where she stashed all the gifts so someone, inevitably gets a gift the day after Christmas or in some cases up to a week later. We don’t mind, it’s kind of a “tradition”, and when it’s me I’m actually happy because who doesn’t like a surprise no matter what day it comes? So after Christmas I’ll show you all the goodies I sent off, for now…shhh. After this interview the wise men went their way. And the star they had seen in the east guided them to Bethlehem. It went ahead of them and stopped over the place where the child was. When they saw the star, they were filled with joy! People traditionally think of a manger/nativity scene with three wise men. The bible never says there are 3, but list 3 gifts, so I guess that’s were the idea that there were three men. The bible also indicates that they found Jesus in his home, after the family had left Bethlehem. So the wisemen should not really be in a nativity scene…unless you put them across the room. But seriously, whether there were three, when they arrived, all not the point. The point is that God gave these men a sign of their Messiah and they followed, requiring traveling a long distance, taking great risks, and seemingly with no doubt about what they should be doing and who Jesus really was. That is just amazing. It’s one thing to know the end and believe, but it’s another to be like these men and Mary and be there in the beginning and trust.